Flowering Season: Spring, Summer, Fall (early). This wildflower mainly blooms after the summer monsoon rains. Description: The flowers are in clusters of 1 to 3 in the leaf axils. 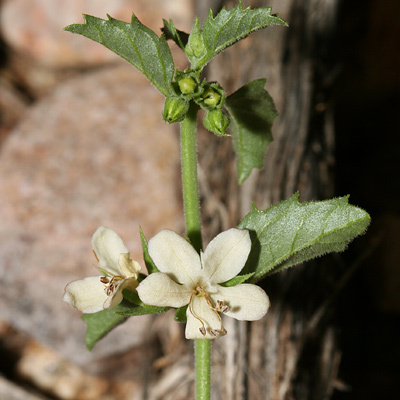 The individual flowers are tubular and have 5 lobes, 4 stamens, and a pinkish floral tube. The flowers are nocturnal and are mostly closed during the day. The flowers are followed by distinctive, wrinkly, green fruits with 4 rounded lobes. 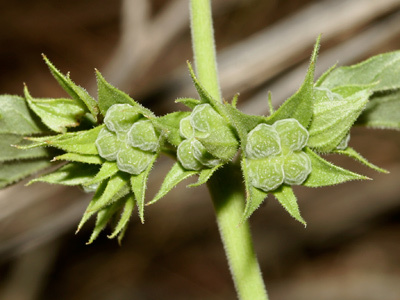 The leaves are green, opposite, variably toothed, and ovate to lanceolate in shape.